Yes. Now it's like going into the neighborhood pub that was once the lively Friday night gathering place for all the locals - and there's only one guy sitting at the end of the bar. He's very friendly as he says "Hi! Your the first person I've seen in three days here! Let me buy you a beer" And you two have the whole place to yourself for the entire evening. Well, then, let's stir things up. I prefer my fueling mods directly in the firmware. I use Motoyoyo's triples and I'm happy with them. They make a difference. Doesn't matter what tire, learn how to ride on it. A little fork work provides performance gains. At dinnertime, put down the fork. $1K track school goes further that $1k horsepower mods. HP gains per part doesn't add up. If I forgot something, fill it in. Blimey don’t mention Scots yokes sorry triples!! They were Rogers undoing!!! As for mods did mine years ago apart from the new injectors I put on the bike last year last time I did any serious modding must be over 10 years ago. 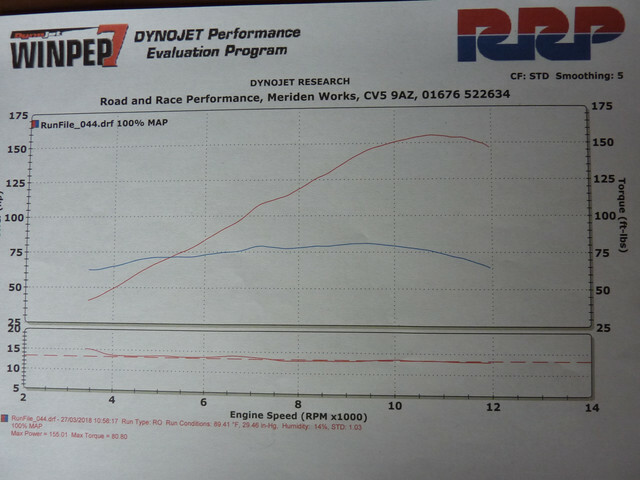 And the reason you need your bike on a dyno because the holy grail is a nice level A/F forget the HP. I was going to try the Innovate LC-2 wideband O2 solution but with the BMWMOA discount that Beemer Boneyard offers the AF-X was too good of a deal. Thanks Roger 04 RT for your contribution and advice. Lets face it, the R11S has quietly become a niche bike. Even though the bikes have sunken in price, the mods for them, whatever is left available, have not. There is a small group of loyal admirers that will carry on the torch no matter what and are willing to spend good money to get bikes running at their best. As the members of the group change their riding habits and/or styles, the group will continue to shrink. I think it has a long way to go before it becomes niche they sold way too many unlike the R90s which was grossly over priced and you could a buy a Z1 for relative peanuts that would blow its doors off overly complicated because Pridmore produced a minor miracle with result at Daytona on the Bm. I still class the S as bargain basement that has less appeal than it did 15 years ago with so many other options that have more HP and easier to live with. Back to the tech end if you ever take your S too a dyno what you are looking for is the A/F my S sheet vanish years ago into the etha but having recently gone the same route with my X/R look at the bottom that's what gets results you want that line as flat as pos. You can’t richen 0-50% throttle in the firmware of a boxer or any Bmw bike starting with the oilheads in ‘94. Thanks for your reply Roger. I had a good read of the link you gave. It’s a whole new interesting universe and I wish I had time to explore it all. To be honest it’s also beyond what I would be confident doing with my experience level. I fear that I would end up with a non runner at best or a somewhat expensive BBQ set! I will stick with my decision for the time being of the AF-xied. Chris said “it’s been the bikes way of selecting its owners”. That is spot on. It gets a hold of you and keeps you interested in it. This could apply to cars too. I’m sure the guys that have been here since the start have seen many changes in the board and the characters on here. But nothing ever stays the same and change is inevitable for better or worse. Wasn’t the bike always a bit niche? Certainly not a mainstream bike imo. In the UK prices seem to be firming up, for especially for the boxer cup models. £5,000 to £7,000. So I think this board has life in it yet, albeit at a lower noise level than before. BMW who had a life time of selling strange bikes to even stranger people came out of the woodwork in 98 with the 1100s the whole point of the bike was an alternative to Hondas VFR and as the years went on got a decent following and you most certainly would not call it niche. It was BM’s stepping stone to greater things instead they shot the selves in the foot with the 1200s and 8 years of marketing went down the drain and the whole concept died a death until the new RS turned up but things have moved on and they missed their chance. The irony here in the UK I/we have 3 routes which we have ridden a lot on the way home from trips too Europe that vary between 175/225 miles the 1100s(with a25L tank) holds the record for 2 and my 17 year old Tiger holds the other neither the K or the X/R have the range at serious speed. Price wise things will change when enough have been ridden into the ground,if Honda Super Dreams can become collectible anything is possible but I think we are 5 years away from that with 1100 but in the mean time my old S can still be very effective when needs be. Chris, certainly R11S was not a niche bike back when it sold new but now it is achieving that status. I am not going to go into details what makes it a niche bike but suffice to say that there is a small group of "believers" that are willing to utilize financial resources in keeping the model alive and running at its best even though same resources can be used to obtain a better model Beemer (or other brand). I also agree with you that one day R11S will wake up to an elevated demand, whether it will happen as soon as 5 years from now is difficult to predict because of how many R11S were sold. BCR will be a good indicator as it was a significantly lower production (and more desirable) variant. As soon as the price points on the BCR turn around, the rest of the R11S market will start rising as well. The last year of R90S was in 1976 and it took about 30 years for the R90S to come into its own. I suppose I should hold on to mine a bit longer then. I put 100,000 miles on an R11S and am planning on doing the same on my R12S. If either bike will ever reach the rarefied height of the R90S it will be the R12S. Shear numbers on one verses the other points to the R12S. By almost any comparison the R12S outshines the R11S. But neither one is a better investment than putting cash in the S&P 500. I dunno just something about this bike is special to me. Thought about getting the 12s but it's ugly. Thought about getting the new 12rs but it has so many electronic features that take away from the mechanical feel i want. Around here the r11s is different.....I've ran into ppl with it before and they saw it as a magical unicorn of some kind! There will always be faster bikes. Better looking bikes. More comfortable bikes. But the r11s just kinda hits all that marks. Like a jack of all trades. The 1200 might because it was such a sales disaster their are very few around so mint low mileage ones will certainly become very collectable. I never understood the logic of the 1200 god knows what BMW were thinking but having ridden against both the 1100/1200 in anger with my K1200 I hated being up against the 1100 because of the amount of bottom end it had,the 1200 was far easier to deal with a lot less bottom end and by the time the motor got going so had my K with heaps more. Terrible sales worked for Ducati 1000 Sport Classic and Honda GB550. What differentiates the R12S is that it was not a step back into history but was improvement over R11S. One of the reasons I ended up with my second BCR is that my friend chose to keep his R12S. I think the R12S looks are closer to HP2S therefore it's hard for me to call it ugly. Going for a ride this afternoon with my friend with his 2016 R1200RS. It's certainly faster and I'd guess more comfortable but whenever we park it certainly doesn't pass as better looking to my eyes or anyone at the curb who stops to admire it. Agreed, the R1100S is unique and a very stylish model. Lovely line and really nicely proportioned. Thanks to the contributors this is still quite a topic of discussion, lol.